The CoverCat 352 is a heavy duty spray system typically used in shipyards, heavy industrial or construction facilities where several spray guns may be used simultaneously from one unit. 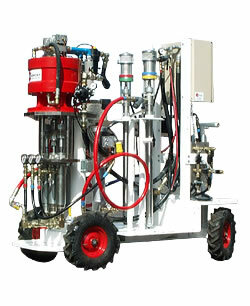 The machine may be used with remote mix manifold applications for fast cure and 100% solids materials. The machine can be up to 60 meters from the Spray gun(s). Paint supply may be small 5 gallon (25Litre), or 55 gallon (200litre) drum. Simply fill in the form below with your contact information and requirements and we’ll contact you. Follow CoverCat online and keep up to date with our latest news and offers.